Day 4 – 74 kms. 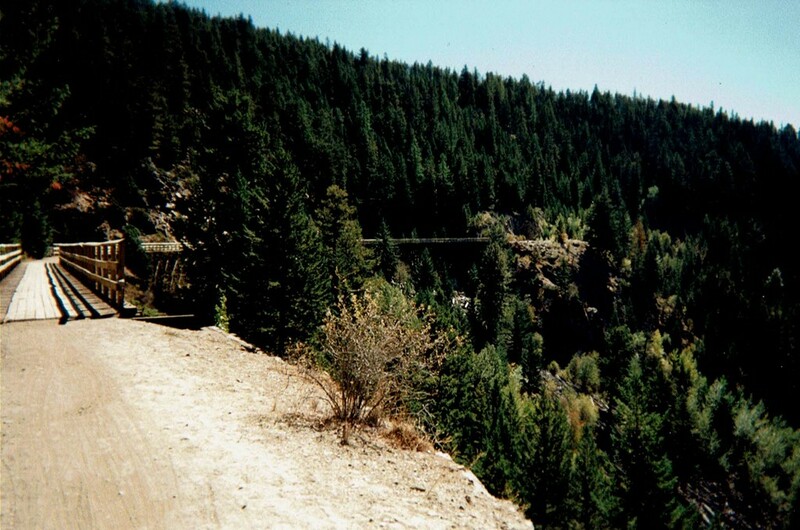 The section of the KVR from Midway to Princeton is known as the Carmi Subdivision and is probably the most travelled, especially in the Myra Canyon area. Up until this section we had seen virtually no other cyclists on our route and surprisingly, even on this popular part, we only met a few. Another early start to beat the heat had us on the road by 7:00 a.m. The trail was only passable in short sections until Rhone Station, and as Highway 33 parallels the trail we alternated between both for quite a few miles. As we were passing through Rhone, we noticed a fellow was calling to us from a house on a hill, so we slowed down and turned into his driveway. It turns out that his name was Paul Lautard and he was very proud to be the custodian of the Rhone World War II memorial in his front yard. He related some of the history of the veterans from Rhone that fought and died in the War and were now commemorated on the plaque of the memorial. He stopped all cyclists that were passing through by calling down from his house on the hill and then running down with a large jug full of cool, sweet, well water; very refreshing for thirsty pedalling people. He also built a beautiful covered picnic area for cyclists to rest up and a “hitching post” for leaning one’s heavy laden bike against. A very amiable and interesting guy! We said goodbye to Paul and thanked him for his hospitality, but time was dragging on and we had quite a few more miles to pedal that day. We rode on for another 30 kms and had some snacks but our stomachs were leading us to the town of Beaverdell for a late but hearty breakfast! In fact it was almost lunchtime, luckily the local coffee shop served breakfast all day; that made us happy. The service was really slow, but the wait was well worth it as we were served the biggest pancakes we had ever seen. In fact, if you can believe it, some of the guys couldn’t eat them all! We did find out that by folding the uneaten pancakes in half, they fit nicely in our panniers and travelled very well to be eaten as a “snack” later on! Full of pancakes, eggs and coffee we did some grocery shopping in Beaverdell and headed back over the bridge to rejoin the KVR. After just crossing the bridge, Larry Mc’s tire went flat. Not just a puncture though, the tire was ruined as his brake shoe had been set too high and rubbed a slit in the sidewall. Luckily he had a spare tire and before long we were on our way again. The next obstacle on the trail was not far away. Wilkinson creek has no bridge, as the actual steel girder rail bridge was moved and was now the road bridge we had just used in Beaverdell. Luckily the creek was very low and we easily forded it. Up the embankment at the other side of the creek and we were back on the trail. Off we went, oops, not quite! Larry Mc jumped on his bike, took a couple of strokes and “ping” went one of his spokes! Rear wheel, cassette side of course! He wangled it out of there and loosened his brake off, away from the now wobbly rim, so that he could continue on and get the repair done later. We passed a couple of other cyclists and one was pulling a Burley trailer that was bouncing around all over the place as the trail was quite was quite the washboard. Then just after seeing them, we passed a field on our left, and not too far away in the field was a bear with her two cubs; we sped up considerably! After another 18 kms of riding we arrived at the site of Lakevale Station and the wilderness campsite of Arlington Lakes. A very nice spot, good swimming but no water source other than the lake. The water filter came in handy again! The couple with the trailer pulled in a little later, and lo and behold, there was a little toddler in the trailer! I thought that he must of been really shaken up, but the couple said that he loved it and that he laughed and giggled all the way! I think that it was about that time that I noticed that Tim was having “Chunky, the soup that eats like a meal” again for dinner. He seemed to have an endless supply of the stuff! I grilled him about this fact and apparently he had brought quite a few cans along as he didn’t know what to expect! No wonder he said his bike felt heavy at the beginning of the trip. But he was eating his way to a lighter bike though! 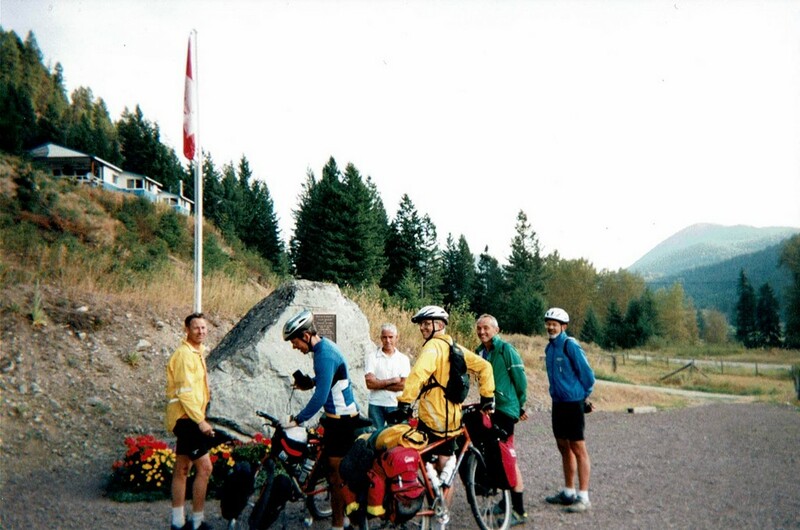 Day 5 – 75 kms. The next morning we were off quite early again and made a beeline for the McCullough Lake Resort, which was about a 22 km ride. Why? – They had food there and we couldn’t pass up a hot breakfast! 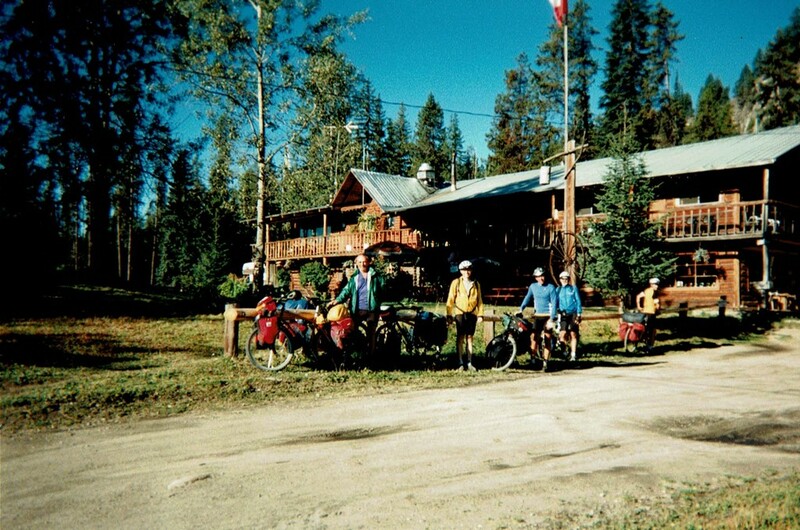 The lodge is in a beautiful place with cabins and a campground all on the shore of Hydraulic Lake. A little further on was the remains of McCulloch Station, named after the chief engineer of the KVR, Andrew McCulloch. Our stomachs full again , we ventured on and found that this part of the trail has been widened and is actually used by logging trucks. Thankfully though we didn’t meet up with any, but the trail surface was seriously wash-boarded. 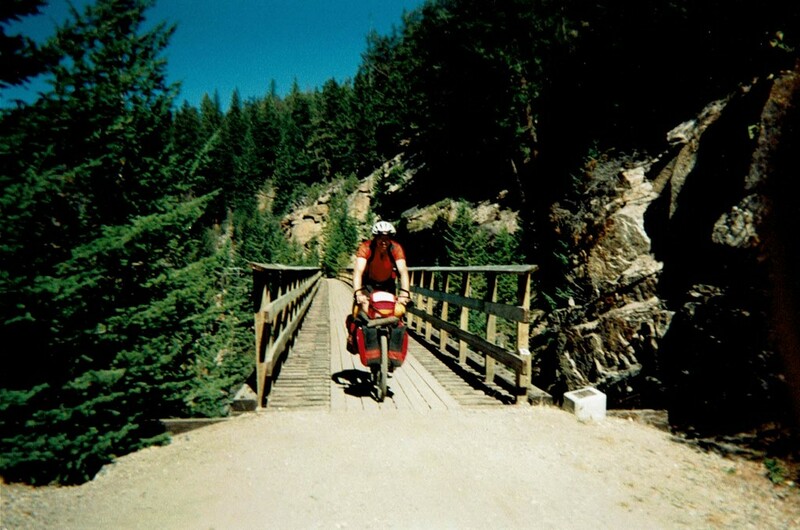 Soon we were entering the one of the most spectacular parts of the KVR, Myra Canyon. There are 18 trestles to cross and and a couple of tunnels to negotiate. The trestles are a marvellous example of engineering, even in this day and age. 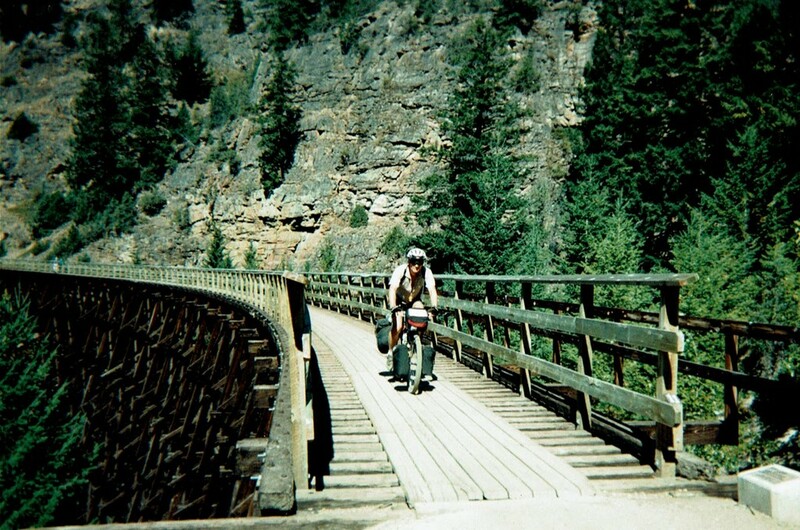 At the end of Myra Canyon we once again had a shared trail/roadway. The surface appeared to have been graded very recently and unfortunately for us was very loose and sandy, our wheels were sinking in making the ride exceptionally tedious. After a few miles we saw a dust cloud ahead of us and it turned out to be the grader that was working on the trail! 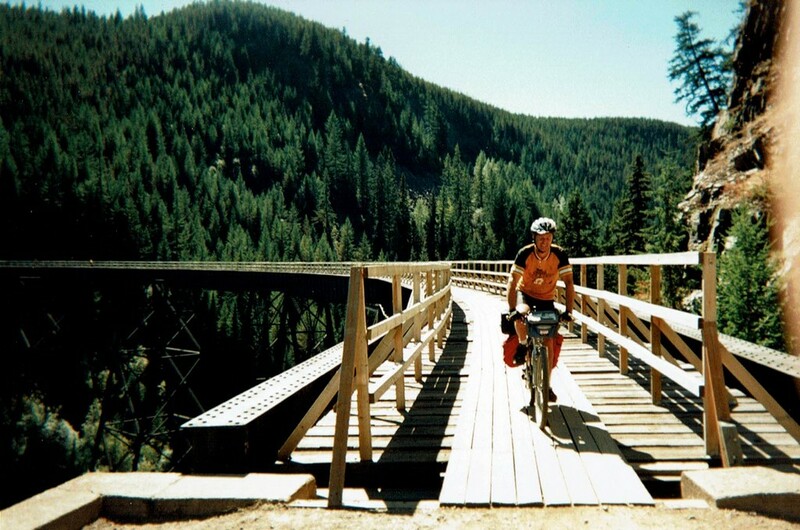 We ate a lot of dust until we eventually passed him and arrived at Chute Lake Station, dusty, thirsty, and tired. 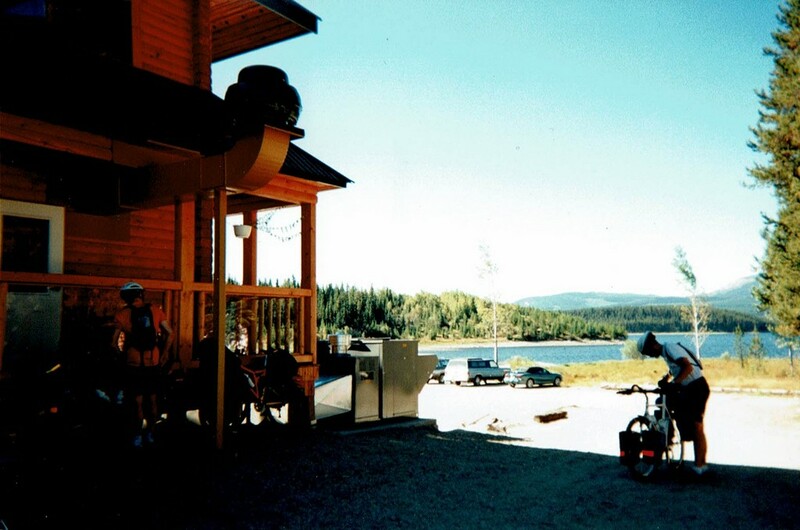 Chute Lake has excellent camping, but the food menu at the lodge is limited, . When we arrived, we went straight into the place and asked for a cold beer to slake our dusty throats, and were told that we had to have something to eat as they only had a restaurant license. Yeah right! – Like we needed persuading to eat! So we slaked our thirst while we admired the historic artifacts and other interesting paraphernalia in the lodge, that dated back to the old railroad days. Day 6 – 32 Kkms. Leaving Chute Lake we were riding in deep sandy trail bed, but fortunately we were on a downhill grade so our only problem was trying to keep a straight path. It was slow going all the same and with a very hot sun again. At this point we entered rattlesnake territory! During the building of the KVR this Naramata section claimed many a life of a railroad worker, as periodic blasting shook angry rattlesnakes from the rocks above. We kept our eyes peeled! Almost immediately after the remains of Adra Station is the Adra Tunnel. The spiral tunnel is 489 metres long and has been blocked due to it’s unsafe nature. There is short by-pass trail which we took and then continued on to find the 4×4 road. This shortcut took the full grade of the downhill run that the railway couldn’t take and hence had to switchback. Hair-raising is a good word for the road for it must have been a 20% grade and in addition, very rough. Our brakes were just smoking trying to keep a safe speed. Larry Mc went sailing past all of us and his mountain biking experience sure came in useful there. I thought he was nuts going that fast, then I realised that he had no back brake because he had loosened it off after he broke the spoke and the rim went out of true! We all made it OK though and were grateful that we didn’t have to go up that steep grade! As we picked up the KVR trail we were into deep sand again. Two small trestles were missing at Arowana Creek, but the trail was filled in with sand, creating two gullies. I thought I’d be smart here and take a run down the first gully and gain some momentum to get up the other sandy side and then down and up again. Well I made the first one and then went down the second one; the bottom of this one was quite abrupt and my front pannier stuck in the sand. Over the handlebars I went, whacked my head and ribs pretty good, and acquired a nice patch of road rash on my knee and elbow. Never, never, will I use a low-rider front rack for off-road use again! I was quite shaken up, the bike was OK though and I just had to fix the pannier hook. Then I could dig out the sand from my bloody knee and elbow, ouch! The first aid kit and hydrogen peroxide came into good use again. 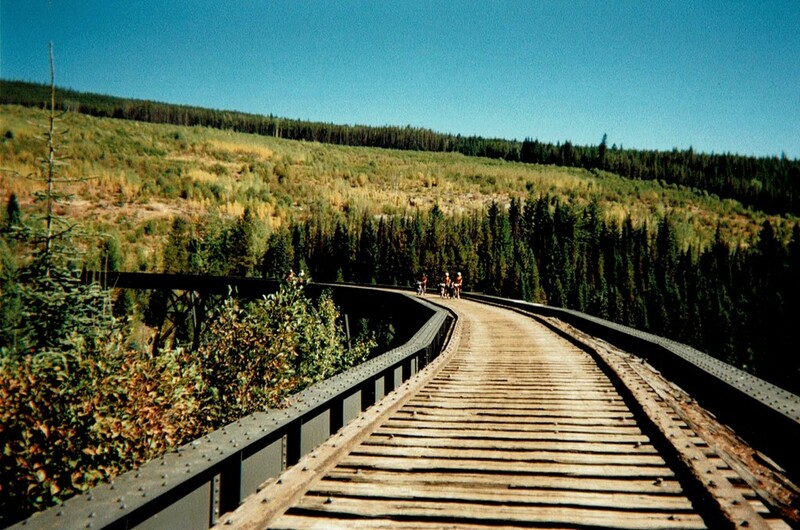 The remainder of the ride to Penticton was relatively uneventful although the sandy trail surface was a constant nuisance, albeit less and less so as we approached the town. Our first stop in Penticton was “The Bike Barn” which is a fine bike shop with a good stock of parts, accessories and bikes. They installed a new spoke and re-trued Larry Mc’s rear wheel in no time and soon we were on our way to lunch at the Kettle Valley Station Pub. Mmm, cold beer and a big pasta lunch! We camped not far away from the pub at the Park Royal RV Park, and although they catered more to the RV community, we shared a nice grassy pad/campsite; between the six of us the cost was very reasonable. The afternoon was spent touring around Penticton. Also for me, a quick visit to the walk-in medical clinic to check my painful bruised ribs, as I was concerned that I may have cracked one during my acrobatics! All checked out well though and I even snagged some free antibiotic ointment for my road rash.